ONCE upon a time, Detroit’s assembly lines rolled out lots of big cars. In those days the Motor City was also home to a big sound that caught on across the nation and the world. The reminiscences of those halcyon days by Motown record company founder Berry Gordy inform “Motown The Musical.” Based on his book, “To Be Loved: The Music, the Magic, the Memories of Motown, the musical is in an open run at the Lunt-Fontanne Theatre. (See video above). “Motown The Musical” begins with BG’s youth and culminates with the 1983 television special, Motown 25: Yesterday, Today, Forever. By now, almost every one of BG's contract writers and singers has abandoned him for richer paydays at larger record company companies. Berry (Brandon Victor Dixon, center) convinces sister, Esther (Marva Hicks, left), and the rest of the Gordy family to believe in his dream in "Motown The Musical." Photo by Joan Marcus. 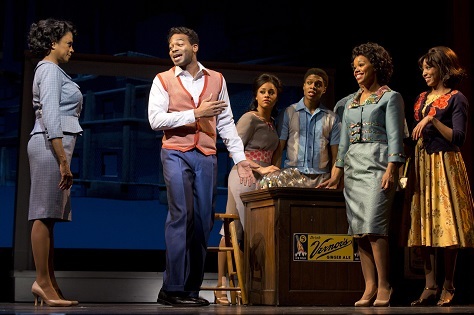 The story BG (Brandon Victor Dixon) tells in “Motown The Musical” is from his point of view. His most lasting legacy is distinctive music known and loved as the “Motown Sound.” He cultivated many stars-to-be like Stevie Wonder (Ryan Shaw). BG’s formula for his music studio, like the formula for this show, was splash and pizzazz, wowing audiences with fancy dance moves and stunning outfits.